Sam Baldock took advantage of some terrible defending to grab a late winner for Bristol City and ensure Notts County slipped into the League One relegation zone. City led when Baldock netted his 24th goal of the season from close range. But Notts deservedly drew level when Alan Sheehan's corner was powerfully headed home by Haydn Hollis. The visitors dominated the second half and missed several chances but Baldock's composed finish won it. Baldock made the most of a poor Hollis header and then got the better of away goalkeeper Bartosz Bialkowski to score into an empty net. Notts are now three points from safety while Bristol City are nine points clear of the drop zone. "Deep down, I thought we were safe after last week [after Walsall win]. "I don't know if it was a game we deserved to win but we're not going to make any apologies for it. "There's been many a game since I've been here that we've really deserved to win and we haven't. "It's a good three points and hopefully that nudges us further up the table." Match ends, Bristol City 2, Notts County 1. Second Half ends, Bristol City 2, Notts County 1. Attempt missed. Wes Burns (Bristol City) right footed shot from the right side of the box misses to the left. Attempt missed. Alan Sheehan (Notts County) left footed shot from outside the box misses to the left. Attempt missed. 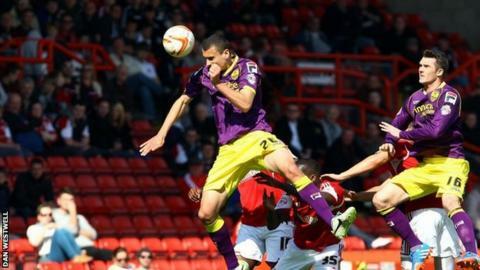 Tyrone Barnett (Bristol City) header from the centre of the box is close, but misses to the left. Goal! Bristol City 2, Notts County 1. Sam Baldock (Bristol City) left footed shot from the centre of the box to the centre of the goal. Ronan Murray (Notts County) wins a free kick in the defensive half. Foul by Scott Wagstaff (Bristol City). Corner, Bristol City. Conceded by Hayden Mullins. Foul by Sam Baldock (Bristol City). Substitution, Bristol City. Tyrone Barnett replaces Jay Emmanuel-Thomas. Attempt missed. Jack Grealish (Notts County) right footed shot from outside the box is close, but misses to the right. Jay Emmanuel-Thomas (Bristol City) wins a free kick in the defensive half. Attempt missed. Gary Liddle (Notts County) right footed shot from outside the box is just a bit too high. Attempt blocked. Alan Sheehan (Notts County) right footed shot from outside the box is blocked. Attempt blocked. James Spencer (Notts County) right footed shot from outside the box is blocked. Substitution, Notts County. Callum McGregor replaces Joshua Vela. Brendan Moloney (Bristol City) wins a free kick on the left wing. Substitution, Bristol City. Wes Burns replaces Martin Paterson. Corner, Notts County. Conceded by Nyron Nosworthy. Attempt blocked. Jamal Campbell-Ryce (Notts County) left footed shot from outside the box is blocked. Corner, Notts County. Conceded by Simon Moore. Attempt saved. James Spencer (Notts County) right footed shot from outside the box is saved in the centre of the goal. Curtis Thompson (Notts County) wins a free kick in the defensive half. Attempt missed. James Spencer (Notts County) header from very close range is just a bit too high from a direct free kick.